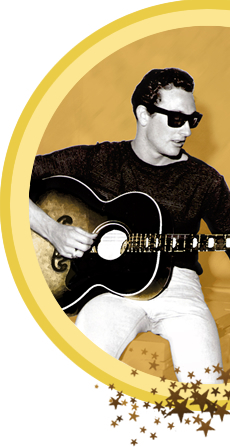 The Studio Recording – Newly recorded and uniquely arranged performances of classic Buddy Holly songs performed by some of today’s most important trademark and emerging artists. The Live VIP Event: The Ultimate Buddy Party – Intimate and fun, the event will feature guest artists performing with an all-star band shot in High Definition for editing with exclusive footage of recording sessions, interviews and behind-the-scenes action. The Multi-Platform Global Releases – Customized audio/visual programs distributed on PBS and through international TV syndication, streamed online and on-mobile, premiered in theaters, and distributed in-market on DVD/CD. The National Talent Competition – Conducted in collaboration with OurStage with initial phases online and finals held in a concert beamed via satellite to participating theaters and judged by viewing audiences across the country in a special, one-night event. In Theater Premiere – An in-theater premiere in movie houses across the country held in collaboration with Fathom Events featuring a special Director’s cut of the DVD together with the real time broadcast of the finals of the National Talent Competition. The Awards & Scholarship Program – Grants, scholarships and a juried award to support the next wave of music’s pioneers.